Flâneur, from the French noun flâneur, means "stroller", "lounger", "saunterer", or "loafer". Flânerie is the act of strolling, with all of its accompanying associations. A near-synonym is 'boulevardier'. He is an ambivalent figure of urban riches representing the ability to wander detached from society with no other purpose than to be an acute observer of society. 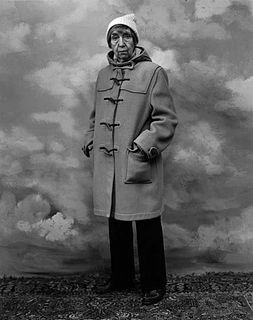 Berenice Abbott, née Bernice Alice Abbott, was an American photographer best known for her portraits of between-the-wars 20th century cultural figures, New York City photographs of architecture and urban design of the 1930s, and science interpretation in the 1940s to 1960s. Libourne is a commune in the Gironde department in Nouvelle-Aquitaine in southwestern France. It is a sub-prefecture of the department. The Musée Carnavalet in Paris is dedicated to the history of the city. The museum occupies two neighboring mansions: the Hôtel Carnavalet and the former Hôtel Le Peletier de Saint Fargeau. On the advice of Baron Haussmann, the civil servant who transformed Paris in the latter half of the 19th century, the Hôtel Carnavalet was purchased by the Municipal Council of Paris in 1866; it was opened to the public in 1880. By the latter part of the 20th century, the museum was full to capacity. The Hôtel Le Peletier de Saint Fargeau was annexed to the Carnavalet and opened to the public in 1989. The Bibliothèque Historique de la Ville de Paris, commonly abbreviated with the acronym BHVP, is a public library specializing in the history of the city of Paris, France. Since 1969 the BHVP has been located in the Hôtel d'Angoulême Lamoignon at 24 rue Pavée, in the Marais in Paris. Atget took up photography in the late 1880s, around the time that photography was experiencing unprecedented expansion in both commercial and amateur fields. He sold photos of landscapes, flowers, and other pleasantries to other artists. It was not until 1897 that Atget started a project he would continue for the rest of his life—his Old Paris collection. The U.S. Library of Congress has some 20 prints made by Abbott in 1956. The Museum of Modern Art purchased the Abbott/Levy collection of Atget's work in 1968. In 1985, MoMA completed publication of a four-volume series of books based on its four successive exhibitions about Atget's life and work. 1 2 3 White, Edmund (2001). The Flâneur: A Stroll Through the Paradoxes of Paris. London: Bloomsbury Publishing. p. 41–43. ISBN 1582342121. 1 2 3 4 5 6 "In Focus: Eugène Atget (Getty Bookstore)". Getty.edu. Retrieved 2013-04-20. ↑ Anne Tucker, Profile of Berenice Abbott, The Woman's Eye (Alfred A. Knopf, 1973), p. 77. ↑ Hambourg, Maria M. "The Collection." MoMA.org. Oxford University Press, n.d. Web. 22 Feb. 2013. ↑ Davis, Douglas. "The Picasso of Photography." Newsweek 98 (1981): 88–89. Print. ↑ Fabrikant, Geraldine. "Paris That Awoke to Atget's Lens." Editorial. The New York Times 3 Oct. 2012, Cultured Traveler sec. : 8. Log in. Web. 22 Feb. 2013. ↑ See Peter Barr's PhD dissertation "Becoming Documentary: Berenice Abbott's Photographs 1925–1939" (Boston University, 1997). Also: Berenice Abbott & Eugène Atget by Clark Worswick. ↑ Figures are inconclusive as to how much Abbott acquired. Paris, p. 246: 1300 negatives and 5000 prints. Photographers A–Z, p. 17: 7800 negatives, 1400 prints. 1 2 3 4 "Eugene Atget – Rights and Restrictions Information (Prints and Photographs Reading Room, Library of Congress)". Loc.gov. 2010-10-22. Retrieved 2013-04-20. Badger, Gerry. "Eugene Atget: A Vision of Paris" British Journal of Photography 123, no 6039 (Apr. 23, 1976): 344–347. Barbin, Pierre. Colloque Atget (Paris: Collège de France, 1986). Buerger, Janet E. The Era of the French Calotype (New York: International Museum of Photography at George Eastman House, 1982). Buisine, Alain. Eugène Atget ou la melancolie en photographie (Nîmes: Editions Jacqueline Chambon, 1994). Kozloff, Max. "Abandoned and Seductive: Atget's Streets" in The Privileged Eye: Essays on Photography (Albuquerque: University of New Mexico Press, 1987). Krase, Andreas; Adam, Hans Christian (2008) . Paris: Eugène Atget. Taschen. ISBN 978-3-8365-0471-3. Leroy, Jean. Atget: Magicien du vieux Paris en son époque (Paris: P.A.V., 1992). Nesbit, Molly. Atget's Seven Albums (New Haven: Yale University Press, 1992). Reynaud, Françoise. Les voitures d'Atget au musée Carnavalet (Paris: Editions Carre, 1991). Rice, Shelley. Parisian Views (Cambridge: MIT Press, 1997). Russell, John. "Atget", The New York Times Magazine, September 13, 1981. Szarkowski, John. Atget (New York: The Museum of Modern Art, 2000). Szarkowski, John and Maria Morris Hamburg. The Work of Atget: Volume 1, Old France (New York: The Museum of Modern Art, 1981). Szarkowski, John and Maria Morris Hamburg. The Work of Atget: Volume 2, The Art of Old Paris (New York: The Museum of Modern Art, 1982). Szarkowski, John and Maria Morris Hamburg. The Work of Atget: Volume 3, The Ancien Régime (New York: The Museum of Modern Art, 1983). Szarkowski, John and Maria Morris Hamburg. The Work of Atget: Volume 4, Modern Times (New York: The Museum of Modern Art, 1985). Atget, Eugène; Wiegand, Wilfried (1998). Eugène Atget: Paris. New York: te Neues Publishing. ISBN 978 3823803638. The World of Atget, 1964. Atget's Gardens: A Selection of Eugene Atget's Garden Photographs, 1979. Eugene Atget: A Selection of Photographs from the Collection of Musee Carnavalet, Paris, 1985. Wikimedia Commons has media related to Eugène Atget . Diane Arbus was an American photographer. Arbus famously worked to normalize marginalized groups and highlight the importance of proper representation of all people. She worked with a wide range of subjects including members of the LGBTQ+ community, strippers, carnival performers, nudists, dwarves, children, mothers, couples, elderly people, and middle-class families. She photographed her subjects in familiar settings: their homes, on the street, in the workplace, in the park—celebrating imagery that seem to reflect our deepest fears and most private wish. “She is noted for expanding notions of acceptable subject matter and violates canons of the appropriate distance between photographer and subject. By befriending, not objectifying her subjects, she was able to capture in her work a rare psychological intensity”. In his 2003 New York Times Magazine article, "Arbus Reconsidered," Arthur Lubow states, "She was fascinated by people who were visibly creating their own identities—cross-dressers, nudists, sideshow performers, tattooed men, the nouveau riche, the movie-star fans—and by those who were trapped in a uniform that no longer provided any security or comfort." Michael Kimmelman writes in his review of the exhibition Diane Arbus Revelations, "Her memorable work, which she did, on the whole, not for hire but for herself, was all about heart—a ferocious, audacious heart. It transformed the art of photography, and it lent a fresh dignity to the forgotten and neglected people in whom she invested so much of herself." Walker Evans was an American photographer and photojournalist best known for his work for the Farm Security Administration (FSA) documenting the effects of the Great Depression. Much of Evans's work from the FSA period uses the large-format, 8×10-inch (200×250 mm) view camera. He said that his goal as a photographer was to make pictures that are "literate, authoritative, transcendent". Street photography, also sometimes called candid photography, is photography conducted for art or enquiry that features unmediated chance encounters and random incidents within public places. Although there is a difference between street and candid photography, it is usually subtle with most street photography being candid in nature and some candid photography being classifiable as street photography. Street photography does not necessitate the presence of a street or even the urban environment. Though people usually feature directly, street photography might be absent of people and can be of an object or environment where the image projects a decidedly human character in facsimile or aesthetic. Joel Meyerowitz is a street photographer and portrait and landscape photographer. He began photographing in color in 1962 and was an early advocate of the use of color during a time when there was significant resistance to the idea of color photography as serious art. In the early 1970s he taught photography at the Cooper Union in New York City. Garry Winogrand was an American street photographer from the Bronx, New York, known for his portrayal of U.S. life and its social issues, in the mid-20th century. Though he photographed in Los Angeles and elsewhere, Winogrand was essentially a New York photographer. Thaddeus John Szarkowski was a photographer, curator, historian, and critic. From 1962 to 1991 Szarkowski was the director of photography at New York's Museum of Modern Art (MoMA). Since 1884, The Camera Club of New York has been a forum to explore photography. Though the Club was created by well-to-do 'gentlemen' photography enthusiasts seeking a refuge from the mass popularization of the medium in the 1880s, it accepted its first woman as a member, Miss Elizabeth A. Slade, in 1887, only four years after its inception, and later came to accept new ideas and new approaches to the medium. Paul Outerbridge, Jr. was an American photographer prominent for his early use and experiments in color photography. Mario Giacomelli was a self-taught Italian photographer and photojournalist in the genre of Humanism. Lisette Model Model lived from November 10, 1901 to March 30, 1983. Model was an Austrian-born American photographer. Primarily known for the frank humanism of her street photography, exact details of Model's life remain unclear. What is known is that she was well known and respected in photographic communities during her life. She continued to photograph and taught at the New School for Social Research in New York from 1951 up until her death in 1983 with many notable students, the most famous of which was Diane Arbus. Her work has been shown in numerous exhibitions and still resides in several permanent collections, including that of the National Gallery of Canada and the J. Paul Getty Museum. 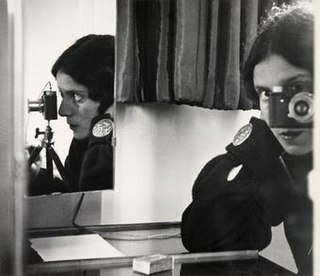 Ilse Bing was a German avant-garde and commercial photographer who produced pioneering monochrome images during the inter-war era. Frank Eugene was an American-born photographer who was a founding member of the Photo-Secession and one of the first university-level professors of photography in the world. Bill Dane is a North American street photographer. Dane pioneered a way to subsidize his public by using photographic postcards. He has mailed over 50,000 of his pictures as photo-postcards since 1969. As of 2007, Dane's method for making his photographs available shifted from mailing photo-postcards to offering his entire body of work on the internet. Gerald David "Gerry" Badger is an English writer about and curator of photography, and a photographer. Todd Webb was an American photographer notable for documenting everyday life and architecture in cities such as New York City, Paris as well as from the American west. His photography has been compared with Harry Callahan, Berenice Abbott, Walker Evans, and the French photographer Eugène Atget. He traveled extensively during his long life and had important friendships with artists such as Georgia O'Keeffe, Ansel Adams and Harry Callahan. He photographed famous people including Dorothea Lange. His life was like his photos in the sense of being seemingly simple, straightforward, but revealing complexity and depth upon a closer examination. Capturing history, his pictures often transcend the boundary between photography and artistic expression. Album was a monthly art photography magazine from Album Photographic Ltd. that published 12 issues between February 1970 and January 1971. Grace M. Mayer was a curator of photography for the Museum of the City of New York and for the Museum of Modern Art.